The first post! It's always really exciting to start something new. I have a good feeling about this thing. To all of you reading this, there's a reason for that. I've sent the first links out to my closest friends, family, mentors, and teachers. You've all played a crutial role in my life. Thank you. The dream didn't last long. Unfortunately, JWU requires their intern students to travel with a visa (even though Denmark doesn't require it of US citizens) and because of company policy, the restaurant couldn't provide one to me. My plan after graduation was to work for a chef I had met while he was doing a guest dinner at Gracies. Chef Keith Luce had been the chef and owner of several incredible restaurants across the country, namely Spruce in Chicago and The Herb Farm in Seattle. He was also the sous chef at the White House during the Clinton administration. He is an incredibly knowledgeable and talented chef with great vision. I decided to take my internship with him at his brand new restaurant set to open this March - Luce & Hawkins (www. jedediahhawkinsinn.com). The restaurant resides in a six room inn (mansion really), a restored sea captains house in beautiful Jamesport, NY. There will be a casual aspect to the restaurant including a separate menu as well as a high end fine dining menu that will include multiple course tasting menus. 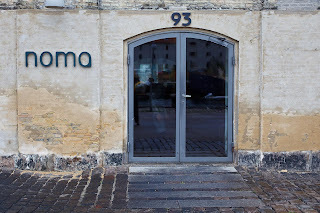 After days and days of thinking it over, I had the feeling I was making a terrible mistake by passing up the opportunity to work at Noma. So, I made an executive decision. One that I couldn't be happier with, and I believe will really work out well. I'm taking a term (three months) off of school and going to Denmark anyway! Sans Johnson & Wales! Fortunately Chef Luce being the understanding man that he is empathized with me and is allowing me to go to Europe and come back to NY to start my internship with him in the Summer. Couldn't have worked out any better! I leave for NY around the 2nd of March. Work with Chef Luce on the opening of Luce & Hawkins. Leave for Denmark early April and stay through May. Back to Providence for graduation (just walking for now). And then finally back to NY for my internship and eventually full employment. Keep the posts coming and listen to your heart AND your gut...they will both lead you in the right direction. So very proud of you.